Hola my beautiful ladies! 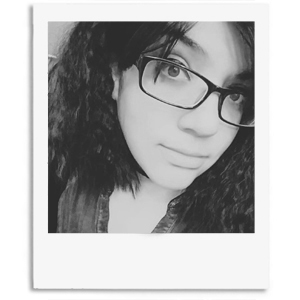 This is actually my second time writing this post X.X I got finished with it only for my Chromebook to act up and not save the document. Woe is me. Luckily I had most of the finer points written down in my notebook. 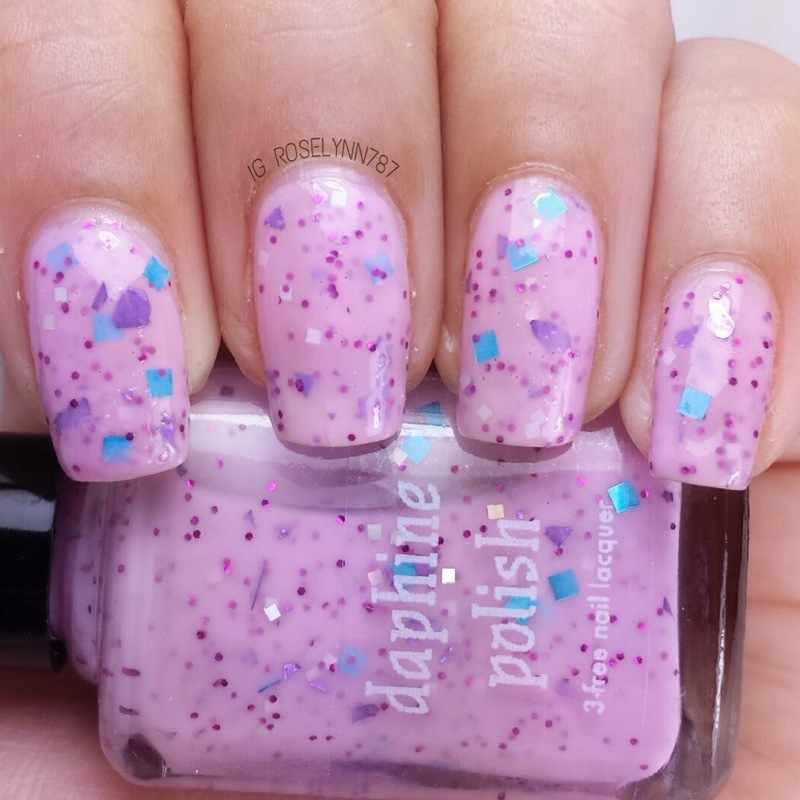 Today I'm sharing a new indie to this page, New York based, Daphine Polish. 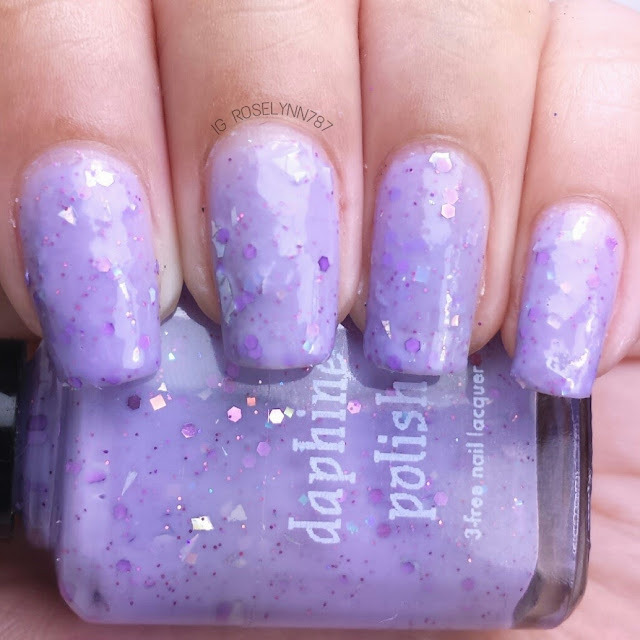 All polishes from Daphine Polish are 3-free and also cruelty free unless otherwise noted. In this post I will be reviewing DP's Spring Top Ten Collection Disc 2, which consists of five beautiful crellys. Let's get to the beauties! 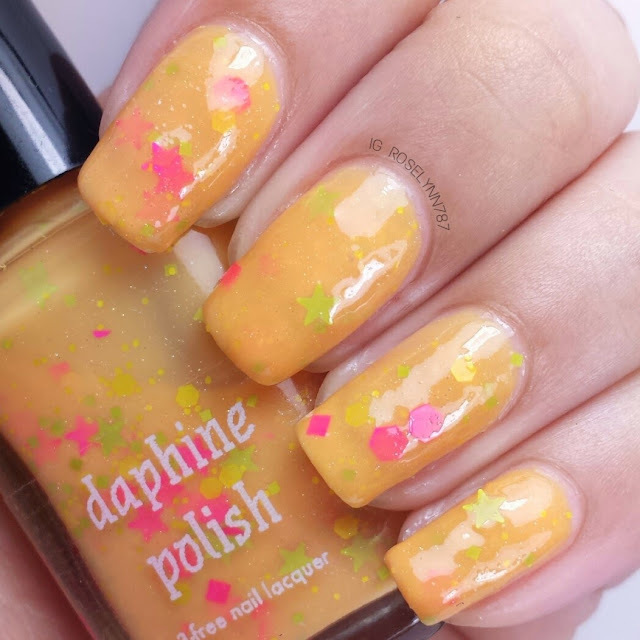 Cosmic Girl is a bright orange crelly filled with multiple glitters such as bright pink hexes, yellow hexes and lime green stars. 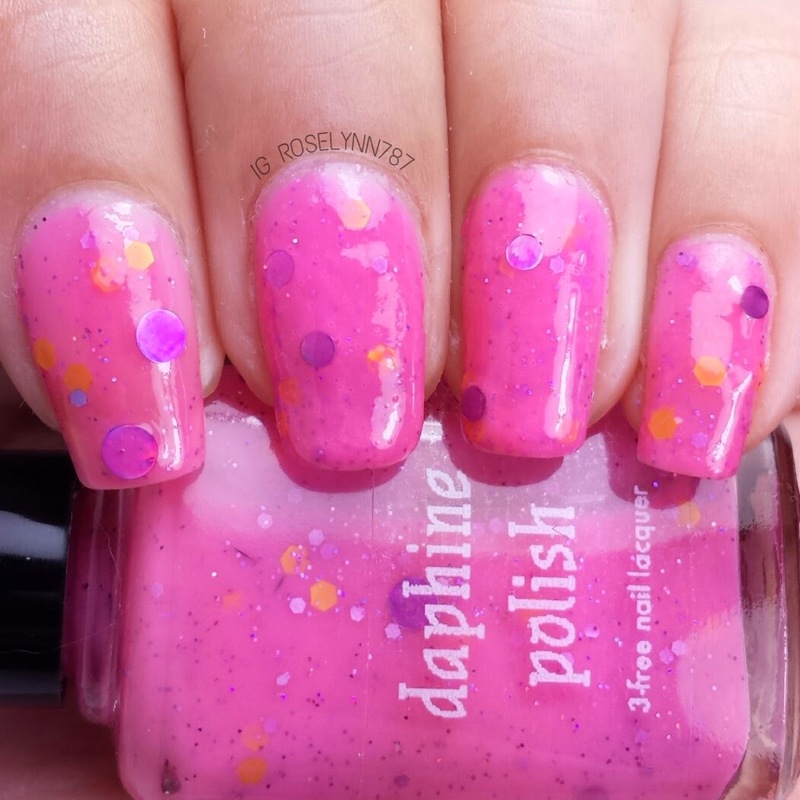 I love this shade for spring/summer! 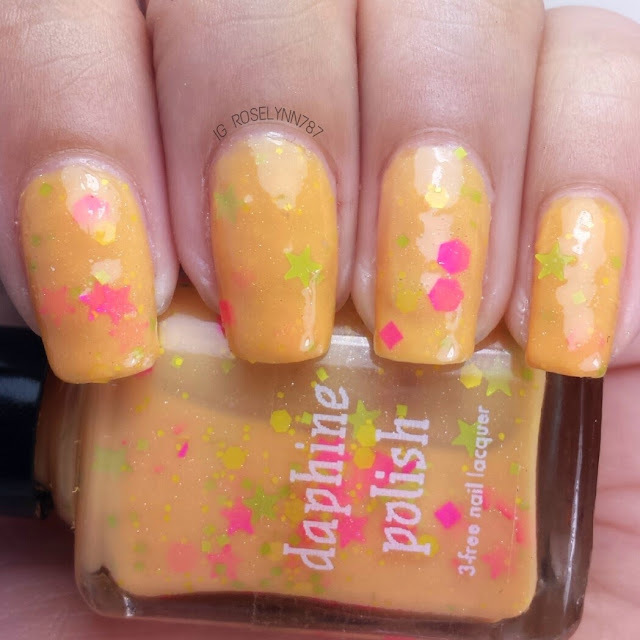 I actually haven't seen a lot of people include orange in their collections so it's definitely a refreshing to see. At first I thought the shade might clash with my skin tone but I was pleasantly surprised. Swatched over a clear base coat, used three thin coats, and sealed with a fast drying topcoat. Even though this is a crelly, a single coat is extremely thin and therefore sheer. You'll need at least three coats for full opacity unless you decide to use an undie. The formula had really good suspension and I didn't find myself having to fish for glitters at all. 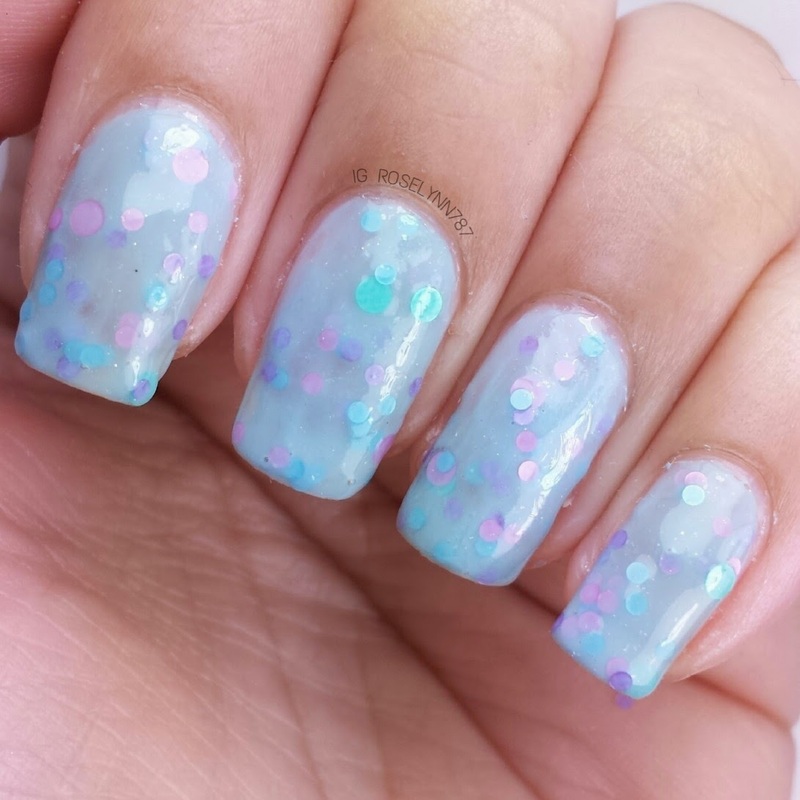 Something Going Round is a soft blue crelly packed with pink, aqua, lilac, and blue circular glitters. 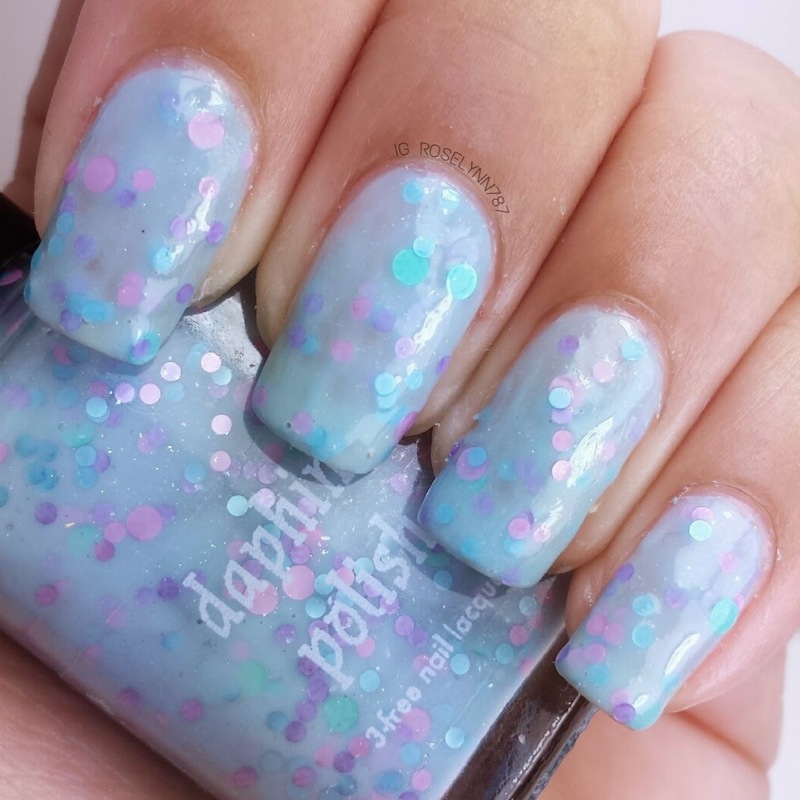 Doesn't this shade make you feel like a fluffy marshmallow? Haha. So much fluff! The shade and the glitter combination are beyond pretty darn cute. 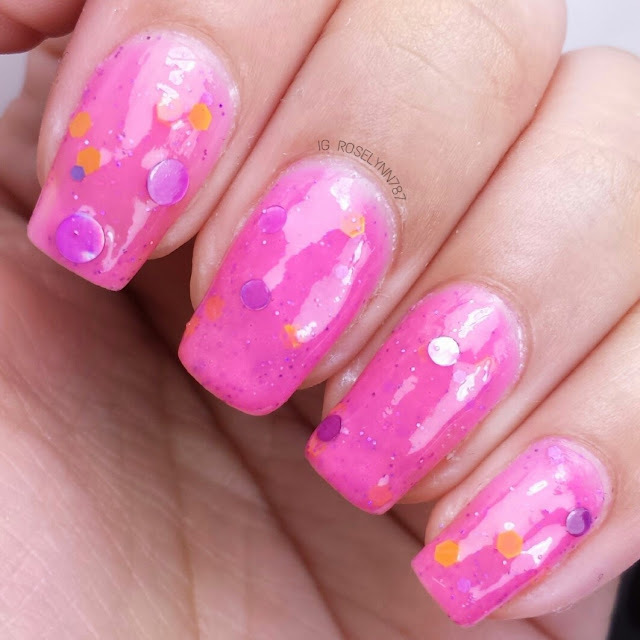 Very girly and perfect for spring. I love it! Swatched over a clear base coat, used three thin coats, and sealed with a fast drying topcoat. You'll find that like the previous one, this crelly is extremely thin and sheer. I had to use three layers to reach the level of opacity I'm comfortable with. Because of the multiple layering, you have to make sure you are careful with the glitters otherwise you'll have some serious build-up. 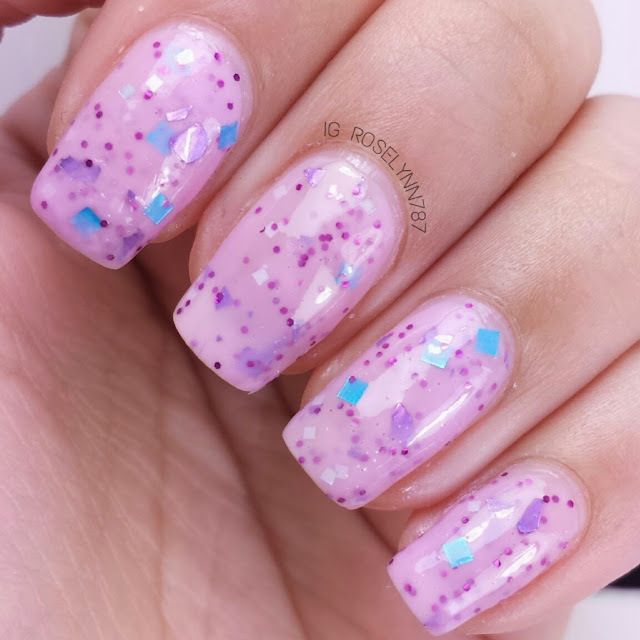 Last Beautiful Girl is a berry pink crelly filled with purple hexes, blue and aqua squares, and holo purple shred glitters. 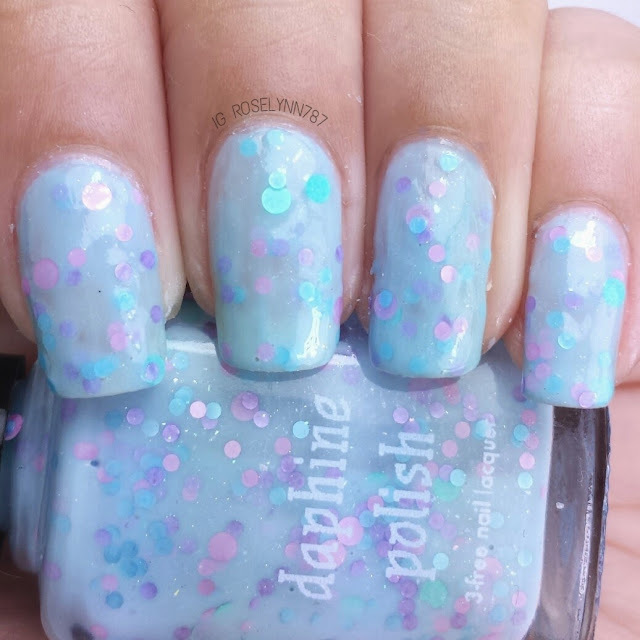 I'm absolutely in love with this very pretty shade. It looks great with my complexion and is a must-have shade for the season. Definitely my favorite and single must-have of the whole collection. Swatched over a clear base coat, used two thin coats, and sealed with a glossy topcoat. Each layer wasn't as sheer as the rest so I could easily get away with just two thin coats. No glitter fishing either which is lovely of course. The formula for this one is easily the best in the bunch. 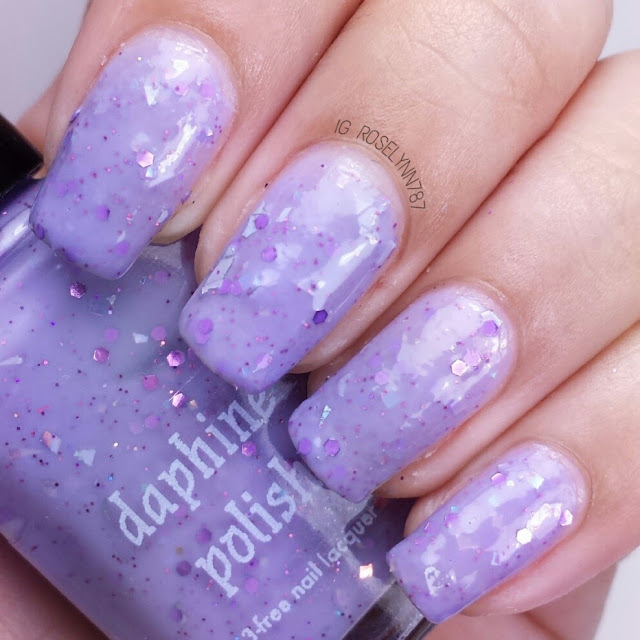 Wallflower is a soft light purple crelly filled with purple hexes, silver shred glitter, and light purple daisies glitters. Even though I love the light shade of purple for the season, this is my least favorite in the whole collection. It's just a matter of personal preference, I don't care for polishes with shredded type of glitters. Swatched over a clear base coat, used three thin coats, and sealed with a fast drying topcoat. I had to use three coats in order for it not to be so sheer. I found the formula for this one to be a bit on the thick side. 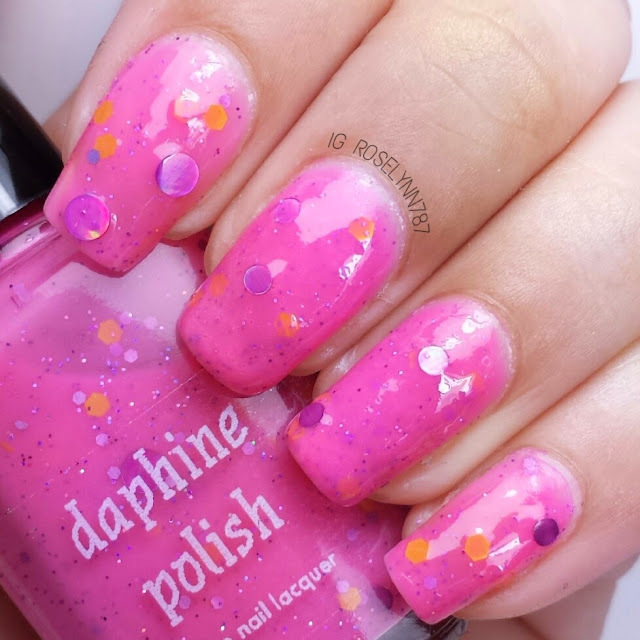 If you shake it well, it definitely helps as well as applying each coat as thinly as you can. 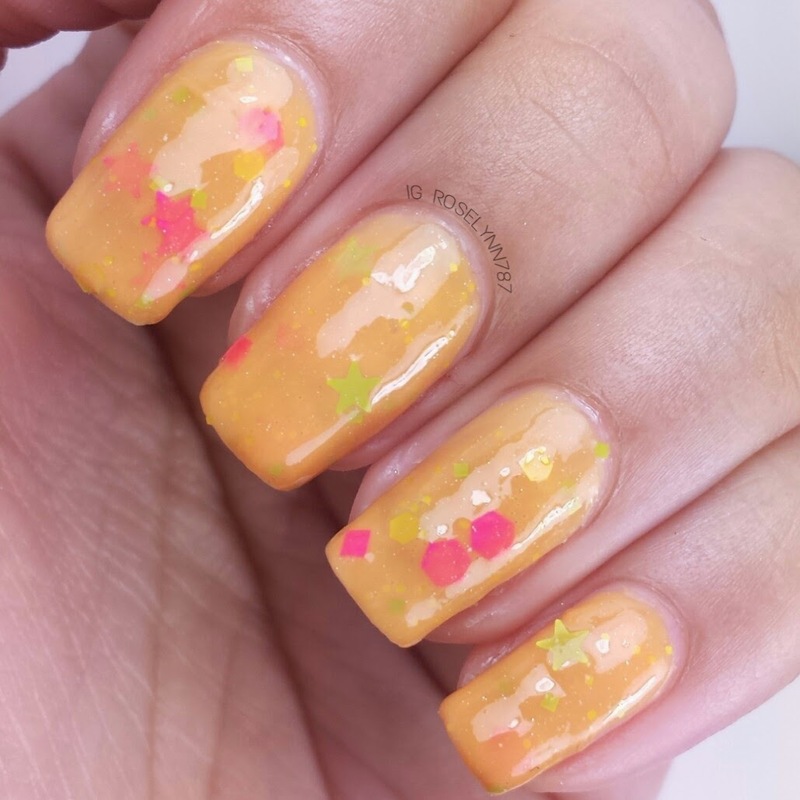 Be careful with the glitters so they don't clump together. Be sure to add a fast-drying topcoat and seal in your mani. Summer Skin is a bright pink crelly filled with orange, yellow, and purple hex glitters. This is the spring/summer pink color must-have. The addition of the glitters in this polish really makes it pop for me, especially the orange glitters. Very nice touch. Swatched over a clear base coat, used three thin coats, and sealed with a fast drying topcoat. The application and formula is consistent with the 4 out 5 polishes in this collection. Very sheer in one layer and will need at least three for complete opaqueness. 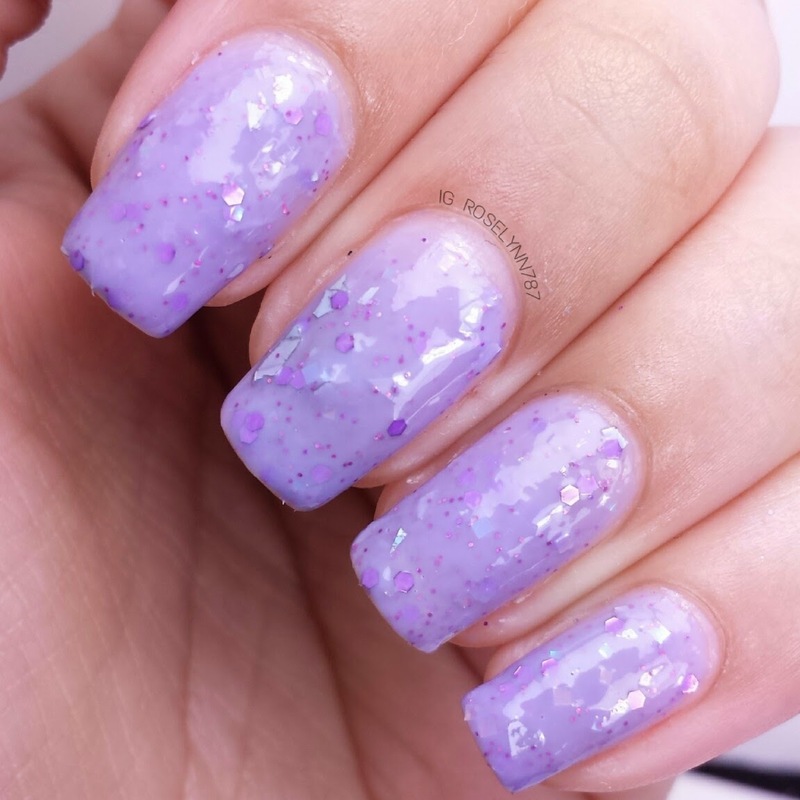 The larger purple glitters require a little bit of fishing but nothing terrible. Overall I enjoyed the variation in colors, however, I wish all of them would have the same formula like Last Beautiful Girl (more opaque). Even though you have to use the additional layers so you don't get an overall sheerness, I think it's definitely worth it. 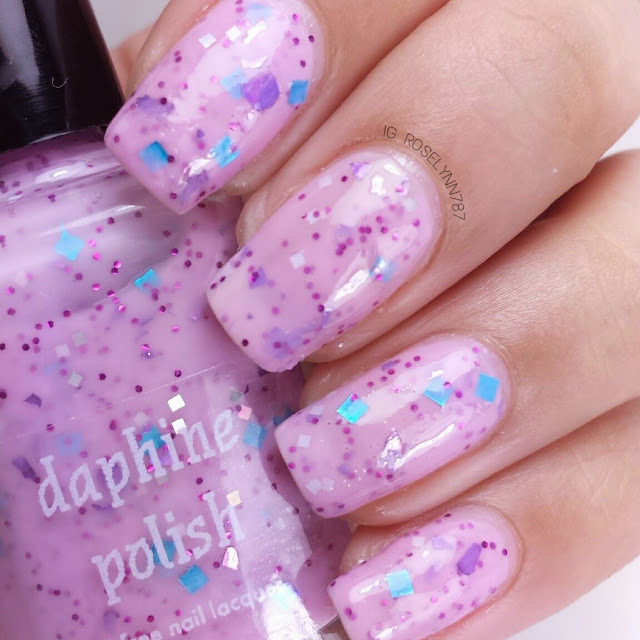 Using a fast-drying topcoat is definitely recommend for every single one, you don't want smudges after applying so many layers! Top Ten Disc 2 is a very fun and spring appropriate collection that I think you guys will like. The Spring Top Ten Collection, both Disc 1 and Disc 2, are available for purchase now and each bottle retails for $10.00. 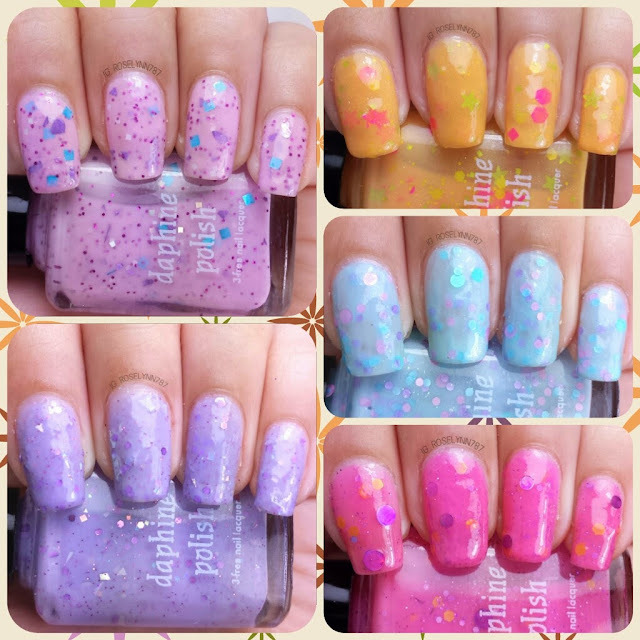 A big thank you to Joanne for allowing me to sample her polishes, I thoroughly enjoyed myself with all the cuteness! Until next time guys, xoxo. Great tutorial. As pastels are in trend now, I definitely should try all these colors. Especially love blue color!